With over 2,000 Seattle educators now having ordered “Black Lives Matter” shirts to wear to school on Oct. 19th, #BlackLivesMatterAtSchool day is shaping up to be a historic demonstration. In addition to wearing the shirts, many educators will also use the day to lead discussions about institutional racism and what Black Lives Matter means. This action has been endorsed by the Seattle Education Association, the Seattle council PTSA board, the Social Equality Educators, and the Seattle NAACP. In addition, over 200 scholars from around the country have issued their support in a collective statement of solidarity. Now some of the country’s preeminent activists, racial justice advocates, and authors, have added their voice to the calls of support for this unprecedented action! Seattle teachers who choose to wear T-shirts that read “Black Lives Matter” and “We Stand Together” have our full support. In the United States today, we cannot do enough to affirm and support our black students. Seattle’s teachers are not only well within their right to exercise freedom of speech by wearing such T-shirts, they are making an important gesture of solidarity — one that gives us hope for the future. Seattle teachers: we’ve got your back! John Carlos was was the bronze-medal winner in the 200 meters at the 1968 Summer Olympics and raised his fist on the podium with Tommie Smith, in what became an iconic protest of racism in the U.S. Today, he is an author, human rights activist, and speaker. Nancy Carlsson-Paige is Professor Emerita at Lesley University where she taught teachers for more than 30 years and was a founder of the University’s Center for Peaceable Schools. Nancy is the author of five books and numerous articles and op-eds on media and technology, conflict resolution, peaceable classrooms, and education reform. Her most recent book is called Taking Back Childhood: A Proven Roadmap for Raising Confident, Creative, Compassionate Kids. Noam Chomsky is a Professor Emeritus at the Massachusetts Institute of Technology (MIT), and is the author of over 100 books on topics such as linguistics, war, politics, and mass media. Melissa Harris-Perry hosted the television show “Melissa Harris-Perry” from 2012-2016 on MSNBC. She is the Maya Angelou Presidential Chair at Wake Forest University. There she is the Executive Director of the Pro Humanitate Institute and founding director of the Anna Julia Cooper Center. Joyce E. King was voted president the American Educational Research Association (AERA), the leading organization of education scholarship in 2013. A visionary teacher and scholar, King is the author of several books and has served since 2004 as the Benjamin E. Mays Endowed Chair for Urban Teaching, Learning and Leadership and Professor of Educational Policy Studies in the College of Education & Human Development at Georgia State University. Jonathan Kozol received the National Book Award for Death at an Early Age, the Robert F. Kennedy Book Award for Rachel and Her Children, and countless other honors for Savage Inequalities, Amazing Grace, The Shame of the Nation, and Fire in the Ashes. Opal Tometi is a co-founder of #BlackLivesMatter and is credited with creating the online platforms and initiating the social media strategy during the project’s early days. She serves as the executive director for the Black Alliance for Just Immigration (BAJI). Jose Antonio Vargas, Pulitzer Prize-winning journalist, filmmaker, and media publisher whose work centers on the changing American identity. He is the founder of Define American. In June 2011, the New York Times Magazine published a groundbreaking essay he wrote in which he revealed and chronicled his life in America as an undocumented immigrant. Dave Zirin was named one of UTNE Reader’s “50 Visionaries Who Are Changing Our World,” he writes about the politics of sports for the Nation Magazine. Author of eight books on the politics of sports, he has been called “the best sportswriter in the United States,” by Robert Lipsyte. Thousands of Seattle teachers wore Black Lives Matter shirts to school. Here’s what it looked like. I remember Tommie Smith when he was the Athletic Coach when I was a student at Oberlin College and Conservatory of Music. It was a pretty radical time then. Jack Scott was the head of the Athletics Department at Oberlin and it was alleged that he had hidden Heiress Patty Hearst, after her kidnapping by The Symbionese Liberation Army, at his Pennsylvania farm house. Tommie and Jack were quite the faculty and sports department. Scott was bought out not long after the FBI Patty Hearst thing. Smith followed later. I wish I had the chance to meet John Carlos. For two Black men to do that during the height of Black Power Movement at an Olympic ceremony in a foreign country, and at the dawn of the White Backlash, and Neo-Conservative movement, is truly remarkable! 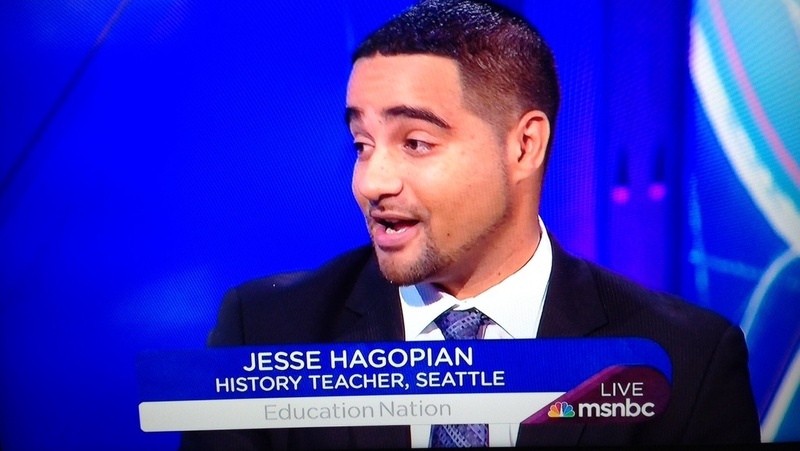 We have some pretty big backs to support and I am proud of Jesse Hagopian and the Seattle Teachers’ Union. P.S. Jesse, I am sorry I did not get to meet you at the SOS Conference in July. Thanks for this list of supporters and your leadership in general. As a side note, I remember very well John Carlos and Tommie Smith. I remember their amazing athleticism and their even more amazing courage. I also remember the ire and negative words from most of my teachers, leaders and some family members around their actions. This moment still resonates with me today. In Georgia, kids will be asked to change shirts. These teachers have shown more bravery and honor than the Black people I know. #Black Lives Matter.